JACKSONVILLE, Fla. - Hurricane Irma is forecast to grow back into a Category 5 hurricane with 160 mph winds before reaching the Florida Keys, the National Hurricane Center said at 5 p.m. Friday. The storm that has killed at least 20 people in the Caribbean and left thousands homeless as it devastated small resort islands in its path has 155 mph sustained winds. It was located 345 miles southeast of Miami -- just over 600 miles from Jacksonville. Irma was a Category 4 storm with maximum sustained winds of 155 mph -- just below highest Category 5 status -- and is forecast to remain at about that strength when it comes ashore someplace south of Miami on Sunday morning. The storm was moving west at 12 mph. The storm is projected to move up the center of the state, and be a weak Category 1 storm by the time it reaches the Florida-Georgia board somewhere near Interstate 95 early Monday afternoon. 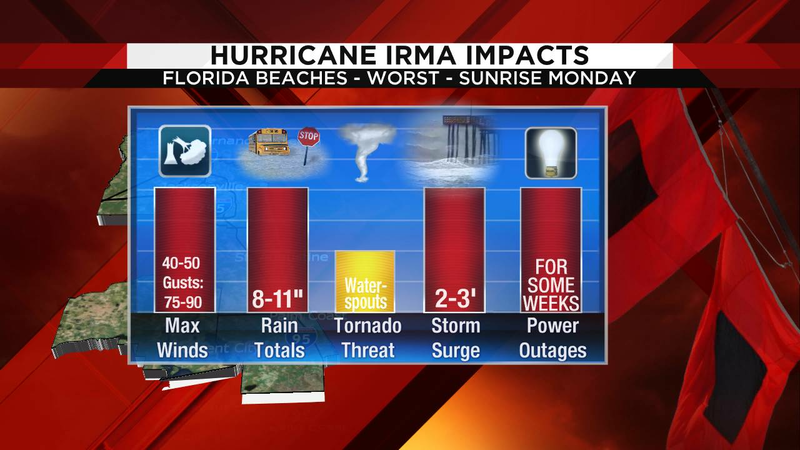 At 5 p.m. hurricane warnings were extended north to Sebastian Inlet on the east coast and to Anna Maria Island on the west coast of the peninsula. A hurricane watch was extended north along the Gulf Coast to the Suwannee River. 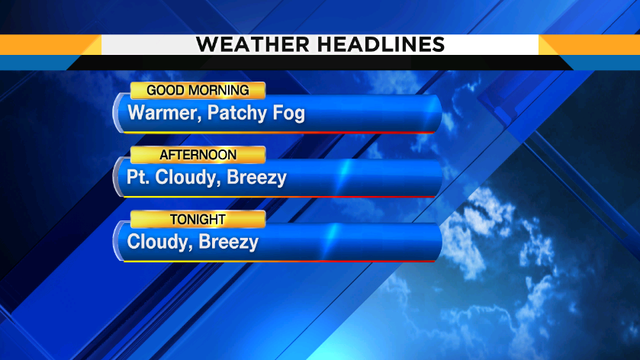 A hurricane warning extends south from Sebastian Inlet to the Florida Keys. A storm surge watch extends north to the Flagler/Volusia County line. 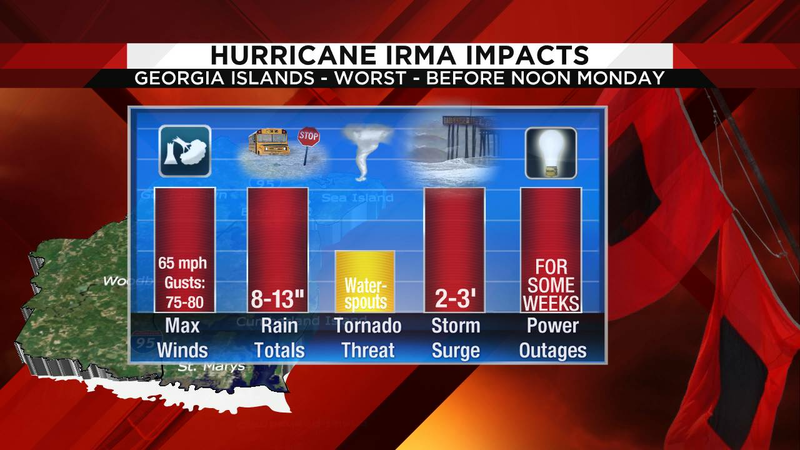 Some fluctuations in intensity are likely during the next day or two, but Irma is forecast to remain a powerful Category 4 at landfall and is projected to be a Category 1 as it passes west of Jacksonville on Monday. 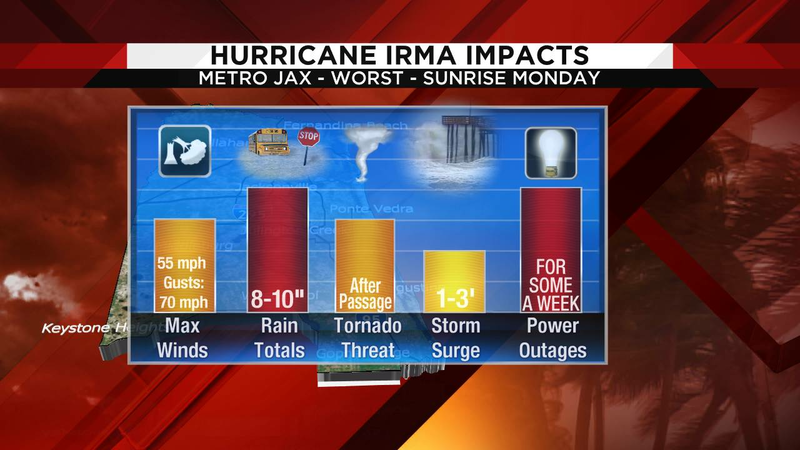 On the forecast track, landfall in or close to south Florida is expected Sunday. Tropical storm force winds could develop over south Florida late Friday night. Jacksonville could see tropical storm force gusts beginning Saturday night with hurricane winds developing Sunday evening through Monday. A track up the state would put Sunday squalls into Jacksonville with winds gusting over 30 mph and even higher starting Saturday and numerous steady rainbands Sunday evening. Due to its size and intensity, massive power outages and disruptions will take place from the Keys to central Georgia. The hurricane watch includes some of the Miami metropolitan area of 6 million people. It was the first of perhaps many watches and warnings along the Southeastern coast over the next several days as forecasters warn the storm could hit anywhere from Florida to North Carolina. At least 31,000 people fled the Florida Keys, which could begin seeing wind and rain from Irma as early as Friday night, Gov. Rick Scott said. He noted the size of the powerful storm, and told residents not to become complacent. 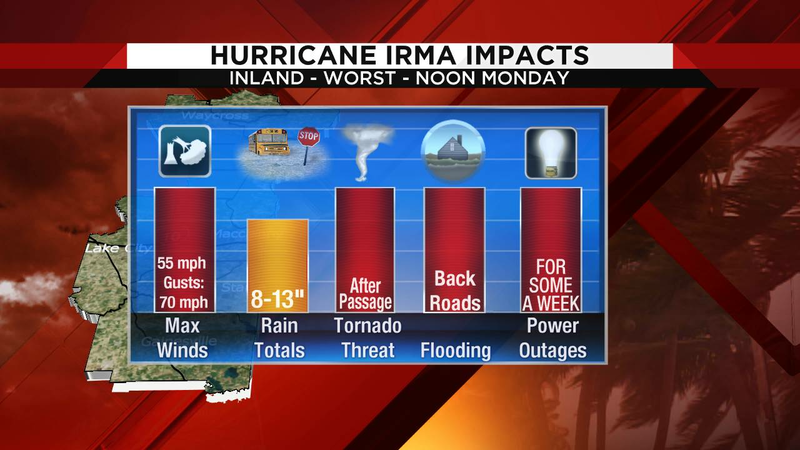 On Monday, Scott declared a state of emergency in all of Florida's 67 counties. Georgia Gov. Nathan Deal ordered evacuations for all areas east of Interstate 95, including the city of Savannah, and authorized about 5,000 National Guard members to help with response and recovery. Models call for tropical storm gusts late Saturday and winds over 40 mph becoming sustained early Sunday and increasing through Sunday afternoon. Hurricane gusts fo 80-90 mph possible overnight Sunday and early Monday morning. Forecasters said Irma could strike the Miami area by early Sunday, then rake the entire length of the state's east coast and push into Georgia and the Carolinas. Irma, the most powerful hurricane ever recorded in the Atlantic, has killed at least nine people and injured 23 in French Caribbean island territories as the dangerous storm roared over the Caribbean, France's interior minister said Thursday. The storm destroyed homes and flooded streets as it roared through a the chain of small islands in the northern Caribbean. This is only the second time since satellites started tracking storms about 40 years ago that one maintained 185 mph winds for more than 24 hours, said Colorado State University meteorology professor Phil Klotzbach. The other was the massive killer typhoon Haiyan that killed more than 6,000 people in the Philippines in 2013.